I am a recovering perfectionist. Not fully cured, but getting better every day. I recently made some noticeable progress when I read about the dangers implicit in perfectionism. The article explained that when I try to be perfect, I have believed the lie that I could actually accomplish that goal. I have somehow convinced myself that, with enough hard work or practice or knowledge, I could truly eliminate all mistakes and errors in my life. I am never going to be perfect. No matter how hard I try, I am not ever going to do or think or speak perfectly – not ever. To appear perfect, I need to hide my mistakes or lie about them or defensively deny them or isolate myself from anyone who might see them. 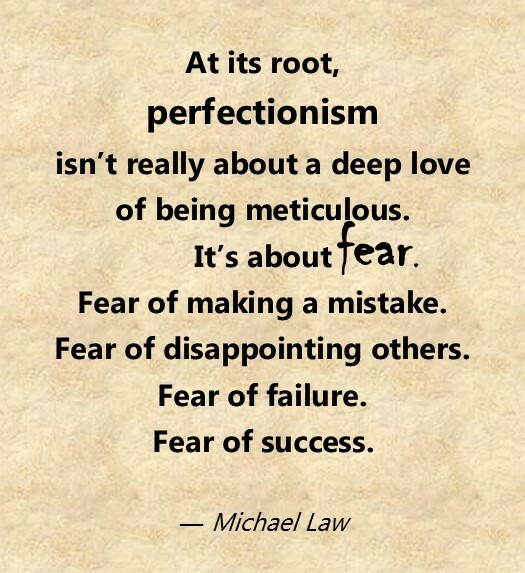 ( = everyone) The perfectionism goal is very exhausting and basically impossible. Instead of trying for perfect, maybe it makes more sense for me to become more comfortable with being imperfect. Not so surprised or shaken up or shamed by my (continual) missteps. The full acceptance of failure and fallibility would allow me to apologize more easily and offer grace more quickly to others when I see the same mistake-making reality in them. I still want to grow and improve in certain life areas, but I have determined that growth ≠ closer to perfection. It just equals greater maturity. Maybe a bit more wisdom. Maybe a little nicer. But not closer to perfect. It is actually a great relief to take the perfectionism burden off of my shoulders. I feel better already. What wrong goal(s) do you chase after?